CONCORD, N.H. (AP) — Students pursuing degrees in tech-related fields in New Hampshire will now be eligible for more scholarship money, thanks to an agreement between the New Hampshire High Tech Council and the state’s public colleges and universities. The chancellors of the University System of New Hampshire and the Community College System of New Hampshire recently signed a memorandum agreeing to contribute matching funds to the tech council’s Kocher Scholarship Program. The two scholarship winners and the logo for the Grace Hopper Conference. On the left, Kristen Tejada. On the right, Melissa Bruno. Two UNH Manchester students will be attending the Grace Hopper Celebration of Women in Computing this October. Melissa Bruno and Kristen Tejada were both chosen as Qualcomm scholarship winners out of the over 1,000 applicants to attend the three-day conference being held in Baltimore, MD. The scholarship will cover registration, hotel fees, and meal costs. 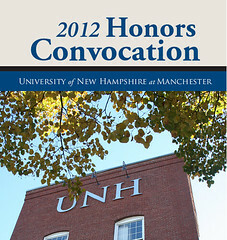 This is the first time that any UNH Manchester students have been awarded a scholarship to participate in this event. The Grace Hopper Celebration of Women in Computing is the world’s largest gathering of women in technology, which will be held for its ninth year in 2012. Participants will be able to network, interview on site with employers for a wide variety of internship and career opportunities, and attend panels that will familiarize them with both recently emerging technologies and works in progress that everyone can expect to see in the future . The UNH Manchester Scholars in Science and Technology (UNHM-SST) project, funded by the National Science Foundation’s Scholarships in STEM program, is providing travel grants for Kristen and Melissa’s participation in the conference. The experience gained at the conference will be shared with the two STEM cohort classes this fall. UNH Manchester students Daniel Pepin of Manchester, NH, and Rebecca Lee of Merrimack, NH have been awarded Summer Undergraduate Research Fellowships by the University of New Hampshire. Pepin, a student in the computer information systems program, received a $3,500 fellowship for his research on OpenITware Platform Architecture to Support Learning and Outreach in the CIS Program at UNH Manchester. Lee, a student in the communication arts program with a minor in computer information systems, received a $1,000 award for her research on Enabling Technology Transfer from the Computer Information Systems Classroom to the Manchester Community. UNH’s Undergraduate Research Opportunities Program (UROP) supports students with their research and creative projects by funding Undergraduate Research Awards (URAs) and Summer Undergraduate Research Fellowships (SURFs). Whether through taking a research-intensive course, working in one of the University’s many centers or institutes, or teaming up with a favorite professor to pursue a mutual academic interest, the opportunities to become involved in research are abound for students of all majors.